If you want to boost your metabolism to burn fat and add muscle mass, then look no further than intervals. According to most research, interval work, such as sprints and circuit training, are the best and fastest way to beat the bulge and get into the best shape ever. According to a study at the University of Western Ontario, subjects opting for 40-minute interval workouts lost 12 percent of their body fat within 6 weeks. Not only that, the 40-minute session increases HDL – or what’s known as the good cholesterol – by 25 percent which will help ward off heart trouble. In another study, subjects ran four laps of 250m at 80 percent of their maximum speed, taking 3 full minutes as recovery between each set. At the end of the workout, levels of testosterone were soaring high for more than an hour after the workout, and also reduced levels of cortisol – a fat storing hormone – thus creating the right environment for fast fitness gains. 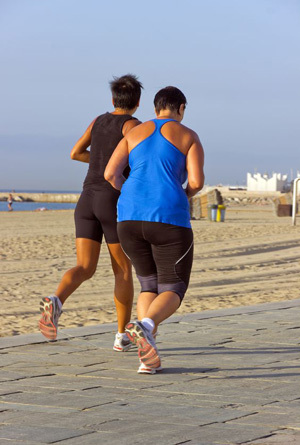 – Start with a 5-minute slow jog as warm-up. – Go for your first interval at 80 percent of your max speed. – Take recovery for 1- to 2-minute, according to your own fitness level. – Repeat the process seven or eight times. – End the workout with a 5-minute slow jog as cool-down. Intervals are the first part of the puzzle. To make it through, you need to back your program with the proper diet; otherwise expect weight gain and more setbacks with your resolution. – Eat breakfast: Start the day with a nutrient-rich and high protein meal as doing so has been proven to curb cravings and unhealthy snacking afterwards. – Shrink your plate: According to a study published in the American Journal of Preventive Medicine, eating in a large plate results in consuming up to 31 percent more food than if you use a smaller one. So make the wise choice and downsize your dish. – Use your red: Red is usually linked to danger and acts as stop sign, but you can use it to your advantage by incorporating it into your eating place setting. In fact, a study showed that you can cut up to 40 percent of your food intake by just opting for this simple color setting change. – Remove distraction: According to a study at the University of Bristol, reducing distractions, such as the phone, the TV set and other gadgets during meal time, can help you tame overeating and unhealthy snacking. – Eat low G.I. foods: Regulating your blood sugar levels is key for weight loss. And one of the best ways to help you do so is by following a low glycemic index (G.I.) diet. Most foods ranking low on the G.I. raise blood sugar levels by a smaller amount and over a longer period of time. To increase the odds of success on your weight loss journey, you need to start keeping track of every calorie you take in and workout you’ve done. Doing so help you shed light on some of the hidden aspects of your eating habits, and gives you also the right tools to help you tweak your training program to your own needs and goals. Keeping a journal is also key for motivation. As you see your numbers improve over time, you’ll no doubt have more resolution to carry on – especially in case you hit a plateau along the way. Now the ball is in your court. The above weight loss shortcuts can definitely help you get the body of your dreams. But you need to take action, persistent action, to make it through. Otherwise, get ready for more weight gain and disappointments.